On the ground floor of the Shippen Place Hotel and adjacent to OneBean Cafe, University Grille is a restaurant for everyone in the heart of downtown Shippensburg, with a large landscaped patio, full-service bar, meeting room, and private dining room available. Just minutes from Shippensburg University. 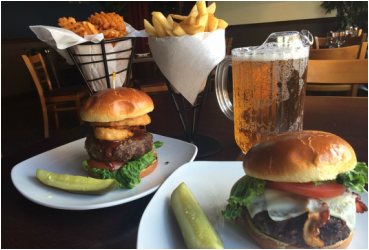 ﻿﻿Our menu features standard American favorites alongside fun creations of our own. Featuring live music every weekend, see our full schedule and make plans for a fun night. 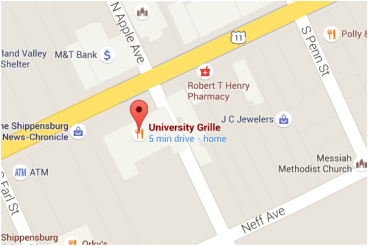 Located at 32 E King St Downtown Shippensburg, just minutes from Shippensburg University. A great way to keep informed about upcoming events, specials, and musical acts.